Footscray in Melbourne’s inner-west is rapidly shaking off its industrial past as it is reshaped by the force of a record wave of new large-scale, high-rise apartment projects. A total of 1,371 units were approved for Footscray in 2015, a 10-fold increase on the number approved in 2013, according to building data from the Australian Bureau of Statistics. 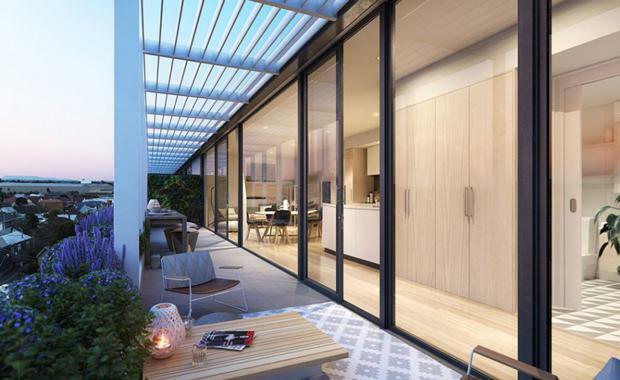 With apartment towers up to 30 storeys set to dominate the future Footscray skyline, a new breed of smaller-scale boutique projects, with a strong focus on sustainability and livability, are also popping up. Footscray’s diverse multicultural population, vibrant markets and café scene, university campuses, schools, public transport and accessibility to the CBD has seen it widely dubbed ‘the new Fitzroy’. This growing public appeal is now flowing through to a new sophisticated, focused style of development, beyond the large towers, and catering to the more discerning owner-occupier buyer. Among them is The Hugo, a new boutique project of just 23 apartments in a sustainable complex featuring a range of innovative designs and technologies. Developed by Faymus Developments and designed by John Demos Architects, the building’s façade boasts a unique, distinct triangular design made with woven metal mesh, constructed with the use of solar panels and perforated materials to capture natural light and air, while solar panels on the rooftop will run the lifts, water pumps and communal lighting. Meeting the need for boutique contemporary apartment living with open outdoor spaces, residents of The Hugo will have access to their own large private garden setting of 300sq m of lawn and native trees.